How to can pickles the easy way! Got a bumper crop of cucumbers? It’s time to whip up a batch of refrigerator pickles! 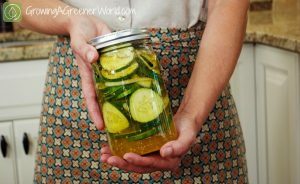 They are not only fast and simple to make, they are also a great way for a beginner to learn how to pickle a cucumber without fear of failure. In as little as 3 days, you can be munching on crisp, delicious slices and you don’t even need to break out the canner! Also known as Bread ‘n Butter Pickles, they are great on sandwiches, hamburgers or just fished out with a fork and eaten straight out of the jar! (That’s the way I eat them). As you can see in the video above, you basically mix up the brine, pour it over the cucumbers, let it cool and store it in the refrigerator. Done! 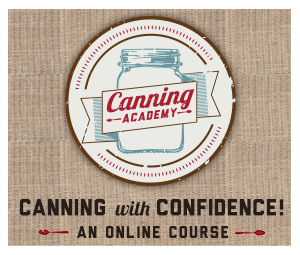 Click on over to our Canning the Harvest page for more canning 101 info and canning videos. Although this recipe is a simple one, there are a few tricks that can make ANY pickle recipe a big hit. The Right Cucumber: Not all cucumbers make a good pickle. Look for (or grow) the traditional knobby varieties that say “pickling” in their name. These stay firm and have the best flavor. Avoid the smooth-skinned “Burpless” or salad cucumbers as they will get mushy when pickled. 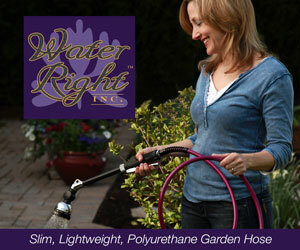 Unblemished Fruit: Wash the cucumbers well and only use firm, unblemished produce. Freshness: The best secret to a great pickle is to create it immediately after harvest. Every day you wait, you lose some of that crisp crunch that everyone wants. 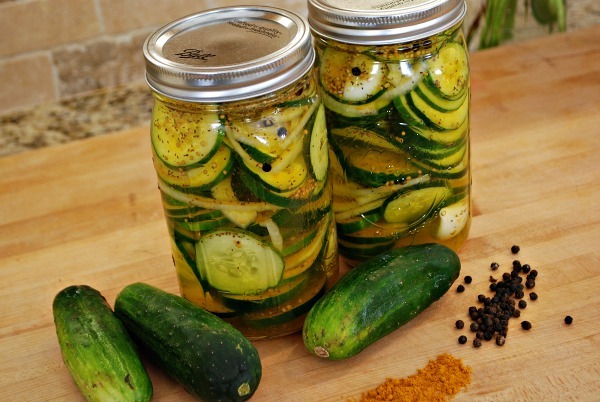 For best results, pickle your produce within 24 hours of harvest. That is why using homegrown or farmer’s market cucumbers is so great – You know they are fresh. The Blossom End: The blossom end of the cucumber (the end opposite from the stem) has an enzyme that can cause a pickle to get mushy. Always discard it. When making dill pickles, I like to cut off both ends so that the cucumber has a uniform shape. Salt: Use pickling or Kosher salt when making any pickle. Regular, iodized salt has anti-caking agents that will make the brine cloudy. (Pickling and Kosher salt do not.) If you can’t find pickling salt, you can use ordinary salt and still be safe. However, the mixture will be cloudy and have sediment at the bottom of the jar. Vinegar: Always use vinegar of at least 5% acidity. Do not use homemade vinegar or a vinegar of unknown acidity or you cannot be sure of the shelf life or safety. Don’t reduce the vinegar in a recipe. If you want a less sour product, add more sugar rather than dilute the vinegar. Spices: You can adjust spices in a pickle recipe and still be safe. Just remember that the spice flavors will get stronger as the produce sits in the brine. In most cases, a little spice goes a long way. Sugar: The sugar in the recipe is for flavor (reducing the sour flavor of the vinegar) and also to help retain the plumpness and firmness of the pickle. You can reduce the sugar and still be safe, but it may change the texture of your pickle and make it more tart. Firming Agents: I do not use firming agents in my quick pickles (refrigerator pickles) because I find that if I use fresh picked produce and a well tested recipe, they are not needed. Jars: Because this is not “canned” or processed, you have an opportunity here to use vintage jars or those otherwise not suitable for the canner. Nothing makes a pickle more special than being pulled from an old, vintage blue canning jar with an old wire-bale lid! Use them here if you have them. Makes 2 Quarts of pickles (or you can use one large jar). These are NOT processed in a canner and must be refrigerated and eaten within 1 month. Trust me, that is not a problem. They are so good, they usually are eaten up in a week! In a large glass jar, layer the cucumbers and onions (alternating the layers). In a medium saucepan, combine remaining ingredients. Heat to a simmer, stirring occasionally until the salt is dissolved. Turn off heat and pour the brine over the cucumbers. I’m learning about fermenting as a way to add good bacteria to our guts. Are these “pickled” without fermentation? How can I can or pickle okra without a water bath canner. Thanks, I LOVE the show! Theresa, I made a double batch of these last night with organic, heirloom Russian Pickling Cucumbers. Do you have a similar recipe I can use to make these and use the hot water bath with for winter eating? Thank You in Advance !!!! I’m sorry I had missed your comment earlier.